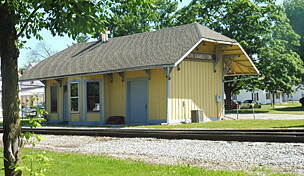 The route begins in rural Madison County, just west of the community of Lilly Chapel at the Wilson Road trailhead. If you went west from here, you'd be on the Roberts Pass Trail, which travels 6.5 miles to London. Go east from Wilson Road instead to take the Camp Chase Trail. 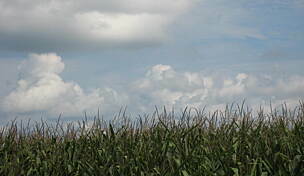 The first mile and a half offers a peaceful trail experience through Ohio farm country; you’ll see fields of soybeans and corn, in addition to well-maintained homes and barns. 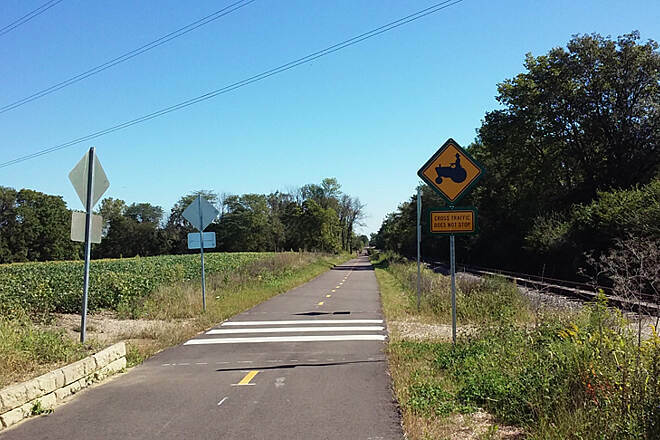 The crossroads at Lilly Chapel are notable due to the grain elevator operation located close to the trail. If you’re lucky, you may see a train being loaded with the bounty of the fields you just crossed. Once past the elevator, fields again predominate the landscape. Georgesville appears in another 3.2 miles. 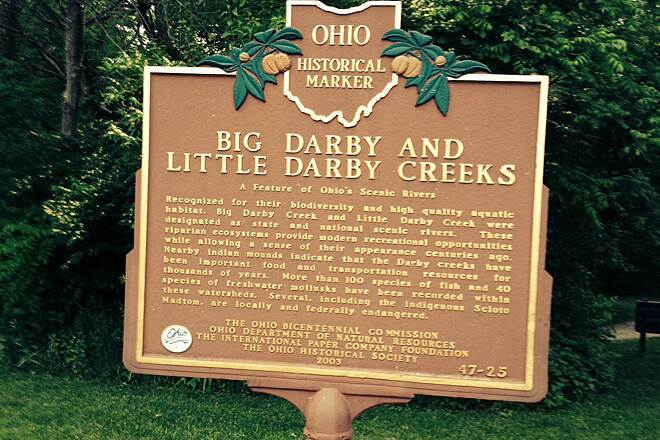 The trail weaves through town, and you head downhill to the Darby Creek Bridge. 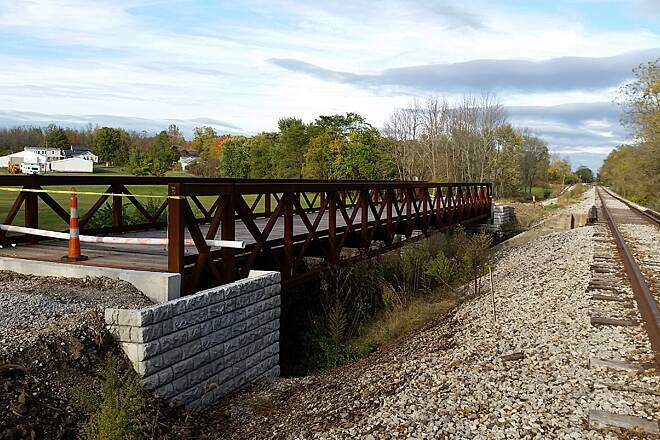 Crossing the bridge takes you into Battelle Darby Creek Metro Park, a recreational gem with 7,000 acres of prairies and forests. 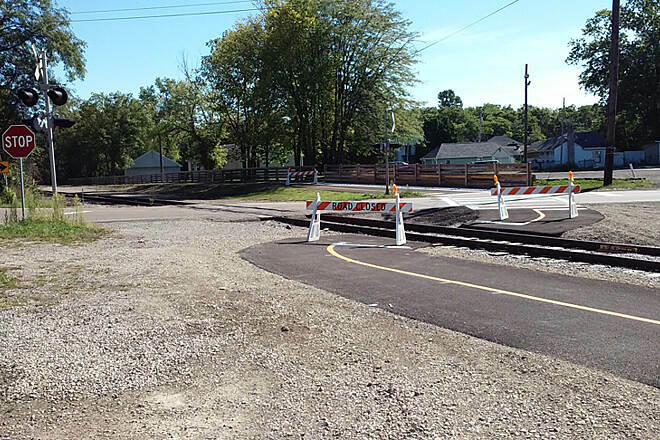 At this point, the Camp Chase Trail is now off the rail corridor for the only time in its entire length. 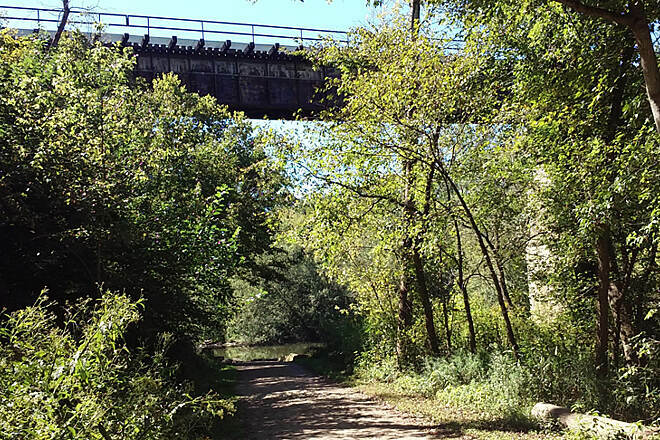 You’ll have a great experience getting close to the creek, crossing under the very tall rail trestle bridge, and then meandering up the hill through the forest. The trail eventually takes you to the park entrance road, and you travel on that road for a short distance back to the rail corridor. 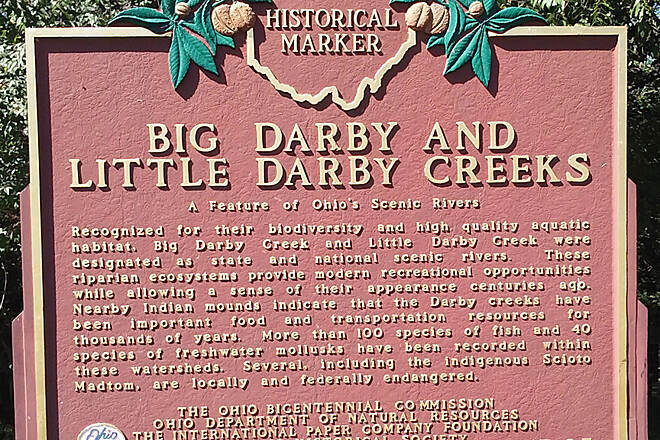 If you wish to explore the park further, take Darby Creek Drive to access the Darby Creek Trail, which winds north through the park. The small town of Galloway greets you just 4 miles past the park. 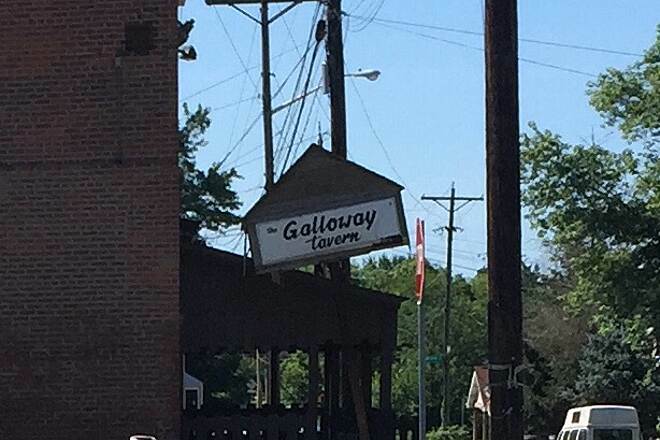 Not far from Galloway the ambience takes on a different character as you enter the first outlying neighborhoods of greater Columbus. Another 2.5 miles from Galloway and almost at the end of the trail, you get a nice treat. 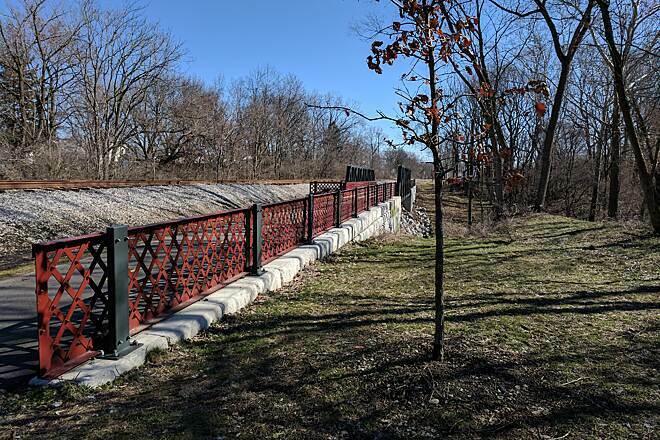 In 2015 a new trail bridge was built next to the active railroad bridge and across the very wide and busy I-270 loop. 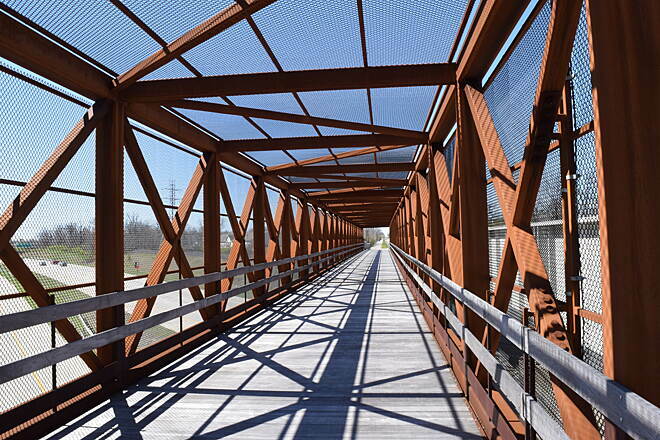 Crossing this bridge means that you’re almost at trail’s end in Columbus’s Hilltop neighborhood. 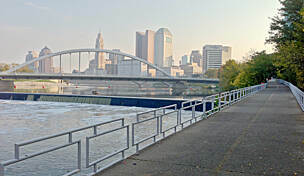 If you’re up for more riding, a short gap of on-road riding will take you to the Scioto Greenway Trail, which follows the Scioto River through downtown Columbus. To reach the Wilson Road trailhead on the west end of the trail: From I-70, take Exit 85 for OH 142 (to Plain City). Head south on OH 142/NE Plain City–Georgesville Road, and go 2.3 miles. Turn right onto US 40/National Pike, and travel west 0.8 mile. In the town of West Jefferson, turn left (south) onto Walnut St.; at Garrette Park, the road veers right and continues as Fellows Ave. In 0.3 mile take a left onto Garfield Ave., then an immediate right onto Lilly Chapel Road. Head west on Lilly Chapel 0.2 mile, and make a slight left onto W. Jefferson Kiousville Road SE. Travel 1.6 miles and, at the fork, turn right onto Wilson Road. Go 2.6 miles as the road heads south; the trailhead parking lot will appear on your right (on the west side of the road). 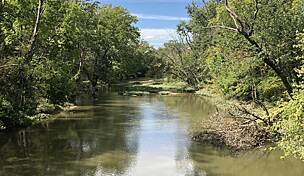 To reach the Battelle Darby Creek Metro Park trailhead: From I-270, take Exit 5 for Georgesville Road, and head west 1.3 miles. Turn left onto Norton Road, and travel south 0.7 mile. 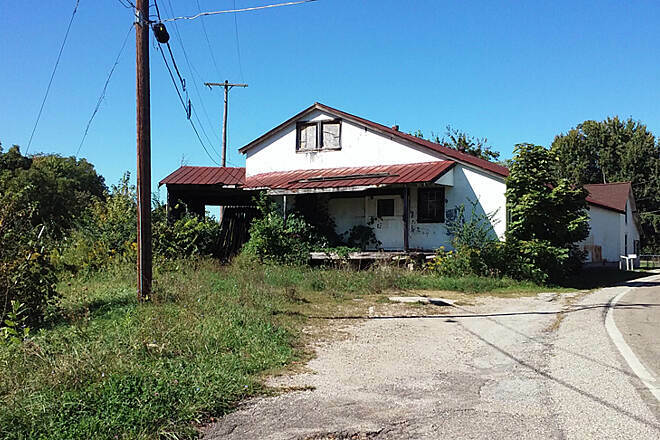 Turn right onto Bausch Road, and travel west 0.9 mile; it becomes Alkire Road. 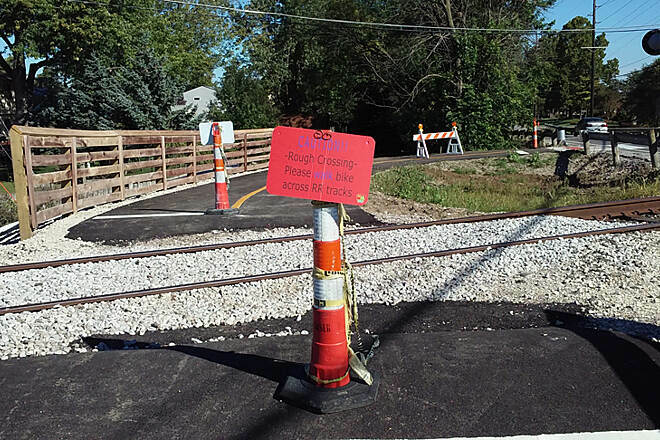 Continue another 3 miles (you’ll be heading southwest); the trailhead and parking lot will be on your left (on the south side of Alkire Road). 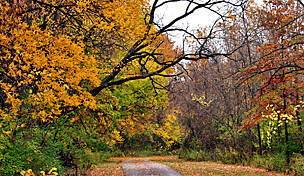 To reach the trailhead at Wilson Road Park in Columbus, take I-270 to Exit 7A, and head east on US 40/W. Broad St. In 1.3 miles turn right onto S. Wilson Road, and go 0.5 mile. Turn right onto Wilson Park Way to reach the trailhead parking. 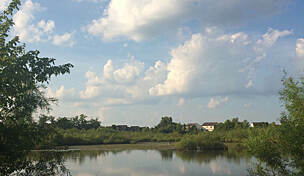 Camp Chase Trail is at the north end of the park. Rode this trail starting at Battelle (parking at the first entrance south of Alkire Rd in a very small lot to the right after entering the park) rode 3 miles east into Galloway and stopped at the tavern to cool off and have a drink. All in all this stretch of the trail was uneventful. Fairly flat with a little incline here and there. During this stretch we crossed Darby Creek Dr, Alkire Rd, Alton Rd., and finally Galloway Rd to get to the tavern. 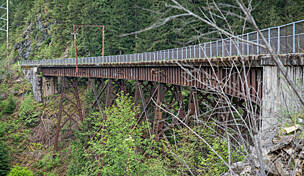 We also crossed the railroad tracks a couple of times. The trail was nicely paved and well maintained, however, there is absolutely no tree cover at all so you are riding the whole time in the blazing sun. Great way to get in and out of the city, and it’s fairly scenic once you get outside the city. 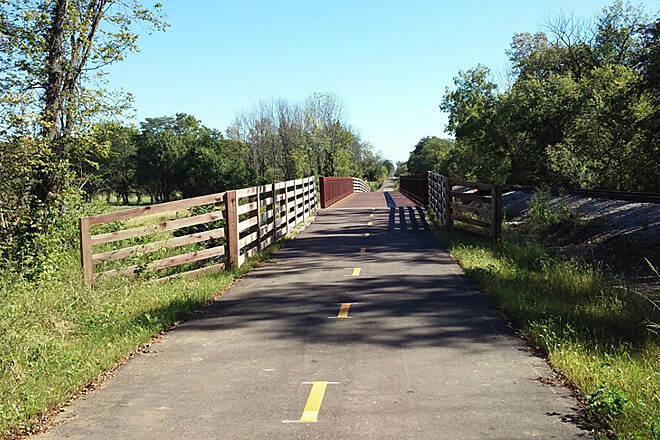 A rails w/trails, so it’s straight and flat and great for biking. 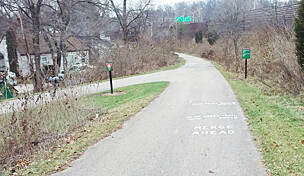 Camp Chase Trail is a new part of the 320 mile Ohio-to-Erie Trail, and this section is much less crowded than other popular bike trails in Columbus. 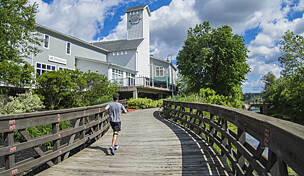 Wilson Road Park has seasonal bathrooms, a bike repair station and a water fountain, and there is also bike repair stations at Wilson Rd Park and at the base of the Hilltop Connector Bridge. 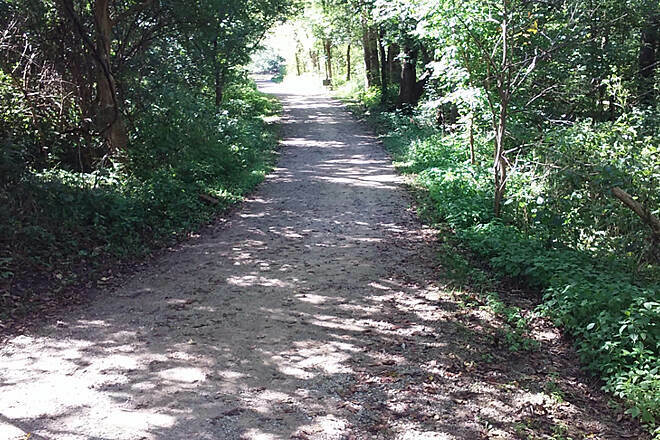 Columbus Westside Running Club maintains the Trail with monthly litter cleanups. Give it a try if you haven’t already! I am a new 43 year old rider on a Mountain Bike. I started this trip at Wilson Rd end, I rode to Columbus. 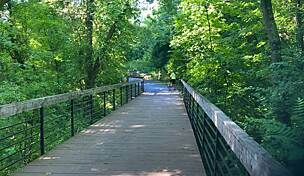 This trail was amazing to be on, I encountered many pleasant riders and walkers. The trail did get confusing at I think it was Battelle park where I encountered Mt. Everest (LOL) was not expecting that hill but enjoyed the off-road ride through the woods. Over all I am planning on riding this trail again only starting in London next time. Over all I finished 22 miles and enjoyed it very much. Very nice well maintained trail. There are several flip flop across the RR tracks. and a couple highway crossings. 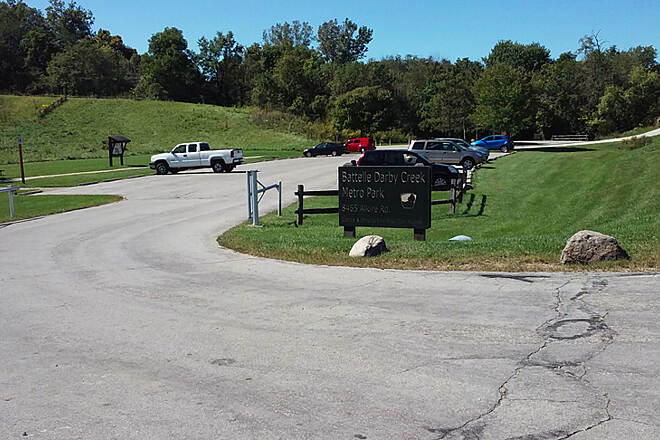 There is a gravel section and a short steep hill in Battelle Darby Park so be prepared to go to the small ring. The trail is in great shape but not much to see along it. 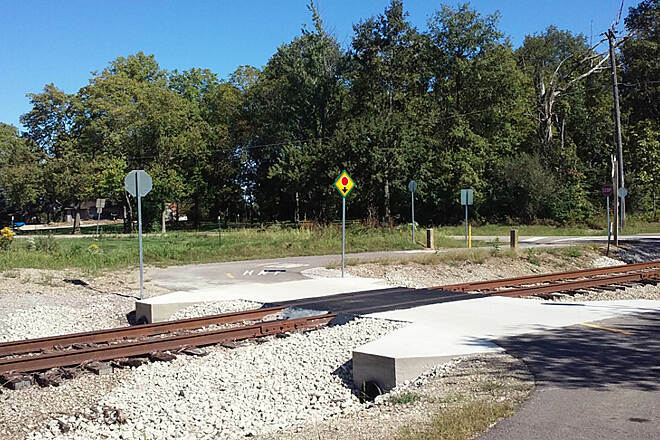 The middle section is not on a rail trail but through a park. Pretty good hills in the park just to warn you if you are looking for a flat rail trail. The park was probably the nicest part. I started at Battelle Darby Park heading west, then continued on Roberts Pass Trail almost to London before turning back. I crossed 2 railroad tracks and 2 to 3 roads. 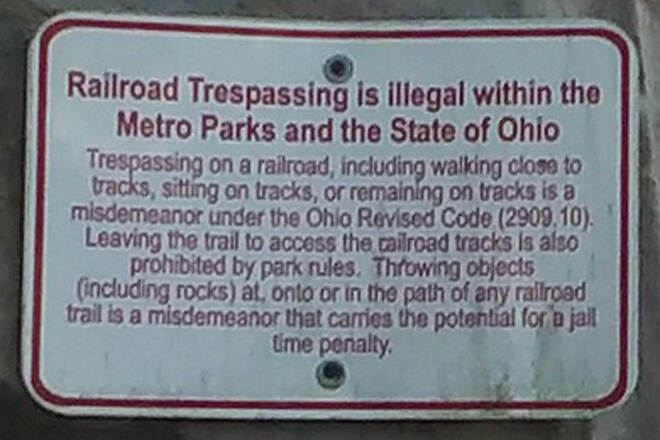 Otherwise it is a well maintained trail with views of Ohio farmlands. Especially important to me, the trail had very few twigs, leaves and stones on it, allowing me to enjoy the scenery rather than dodge these potential hazards. Loved it! 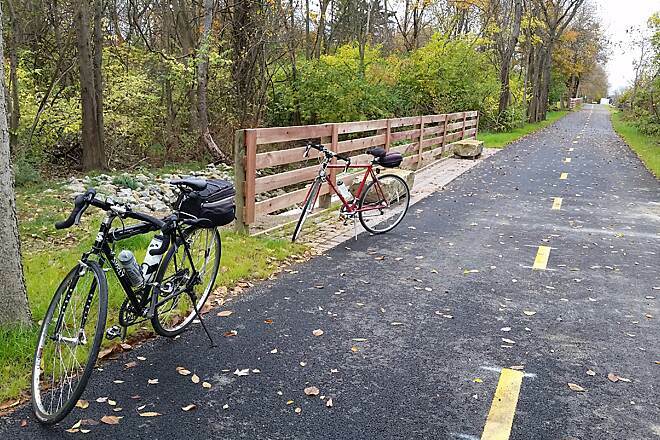 Metro Parks is asking that trail users not park in the lot at Galloway Tavern. Signs are posted. 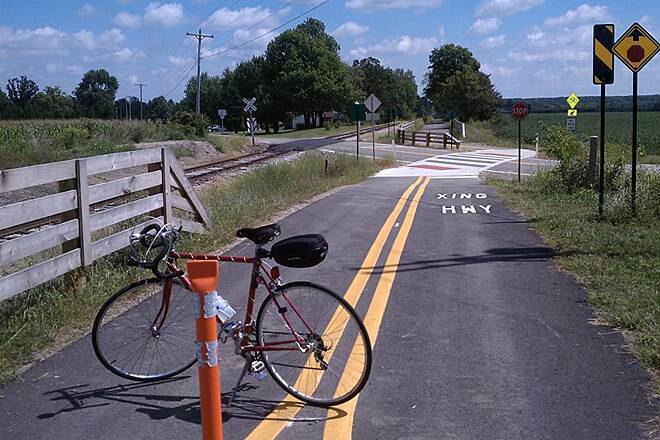 Limited parking is available in 6 spots along the trail (off O'Harra Road). Tavern parking is for tavern patrons only. Parked at Galloway Tavern and cycled back east a couple miles until trail ended, I think at Sullivant Ave. 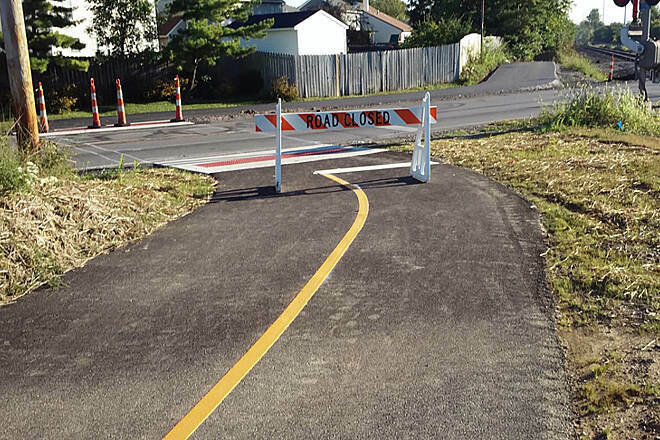 Trail is recently paved. We didn't see any clear mile or km markers that made sense so we weren't sure how far we had biked. Returned to the Tavern, then continued west to the park and back. Went in to have a brew at the Tavern but service was too pokey. All in all, a pleasant ride and not crowded at all. 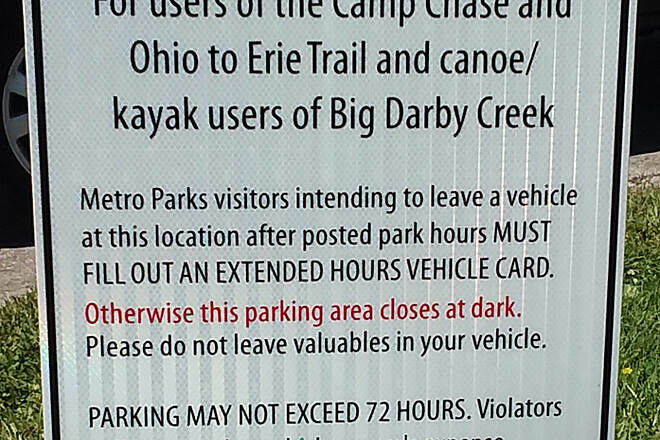 I parked in Galloway and rode to Battelle Darby Creek Metro Park. Although I followed the signs, I missed the rest of the trail once I got inside the park. 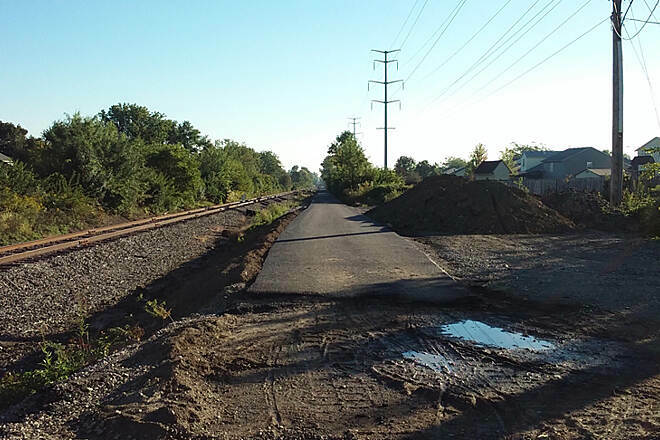 I did ride back to Galloway and on to Hall Road where the rest of the trail is being paved. Can't wait for this to connect to Columbus! 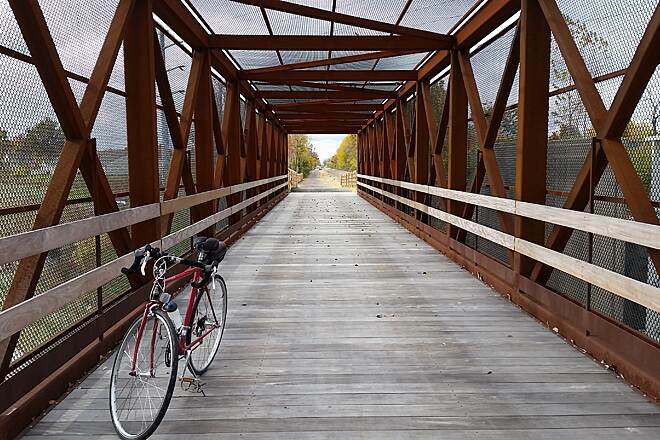 Trail extends west to London, Ohio and takes you through rural farm lands. From the parking lot at Batelle Darby metro park to London and back is approximately a 24 mile round trip. 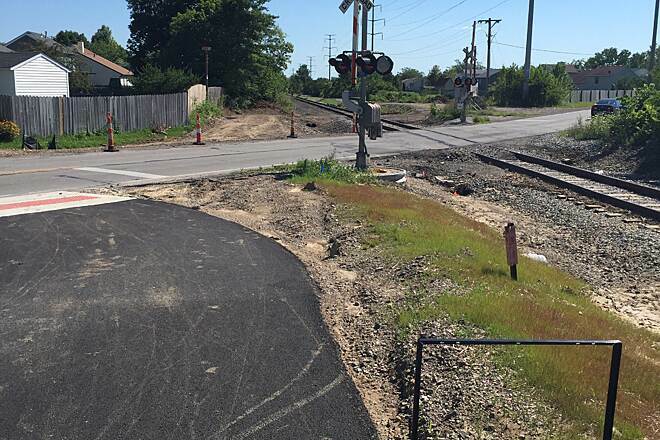 The trail is under construction to the east toward Columbus; currently you can ride as far east as Galloway. There are bathroom facilities available at the Batelle Darby parking lot. 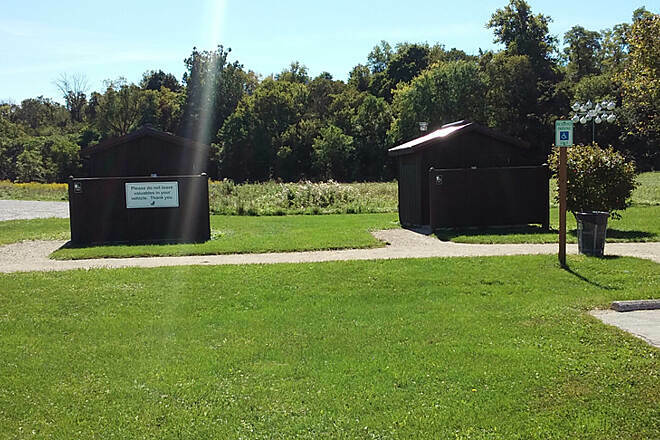 There is also a porta john about 5.5 miles west of the park trail head at the Wilson road trail parking lot. There are no water fountains at either spot, so be sure to bring your own water. The trail is pleasant and has light traffic. It is paved and in good condition. Great, flat paved trail. Rode it to Roberts Pass and continued to London. Sparsely populated on a Saturday afternoon (though it did rain). 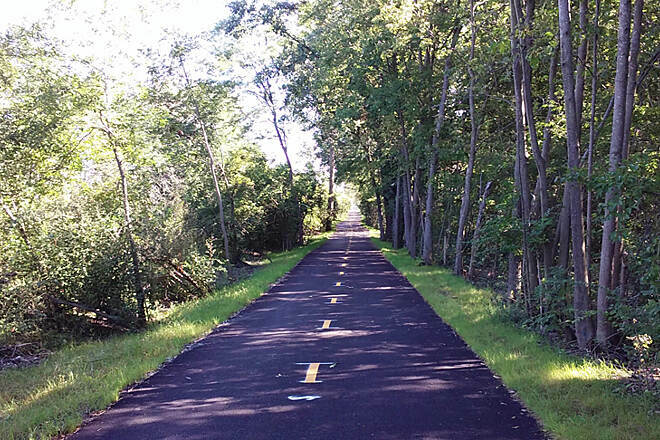 The Camp Chase Trail is a paved multi-use trail and it is close to 7.5 miles now and will be 15 in the next 2-3 years. 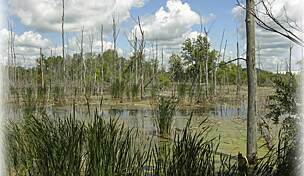 The easiest place to access it is within Battelle Darby Creek Metro Park. 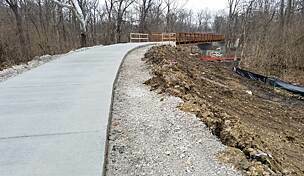 Your description says it is crushed stone, but the trail is paved everywhere except the small connector thru the metro park where it is stone. 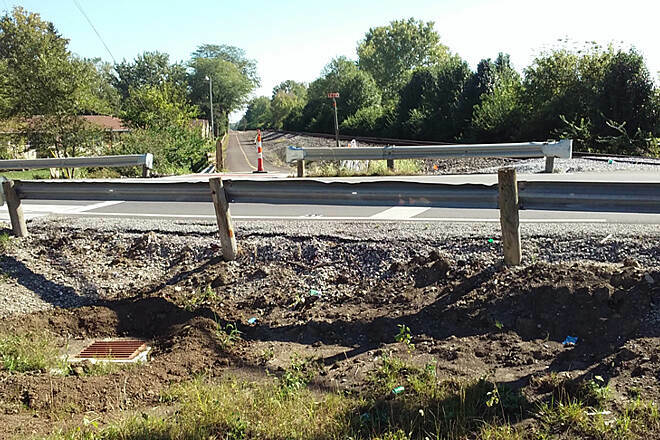 The NE trail point is Alton Road and it will reach Galloway Rd in the near term.